Finance has been secured for a Birmingham city centre office block - set to be the largest ever speculative office development built outside London. Building work can now begin on the long awaited Three Snowhill development at St Chad&apos;s Queensway following confirmation of a £200 million deal between M&G Real Estate and Two Snowhill developer Ballymore. The deal for the 16-storey office block follows M&G Real Estate’s acquisition of Two Snowhill in 2014 and forms the next stage of Birmingham’s wider Snowhill masterplan, dubbed Birmingham&apos;s answer to Canary Wharf. The 420,000 sq ft development, the final phase of Snow Hill, will create 450 construction jobs and house up to 4,000 office workers when it is completed during 2018. The block will also house shops or cafes at ground floor level. M&G is working with Snow Hill builder Ballymore on the project. Chancellor George Osborne welcomed the Budget day deal: “We want to make the Midlands Britain’s engine for growth and this landmark announcement will play an important part in that plan. M&G chief executive Alex Jeffrey added: “Demand from both domestic and international businesses to secure high quality office space in Birmingham has significantly increased, and this is set to rise further with planned infrastructure improvements such as HS2’s Phase One confirmed to start in 2017. Ballymore’s chief executive Sean Mulryan said: “Ballymore committed to Birmingham and the Snowhill scheme over ten years ago. That long term commitment has resulted in the successful transformation of Snowhill into a new and thriving business district - already home to some of Birmingham’s largest office occupiers, including KPMG , Barclays, Gowling WLG (formerly Wragge & Co) and the HS2 Construction Headquarters . 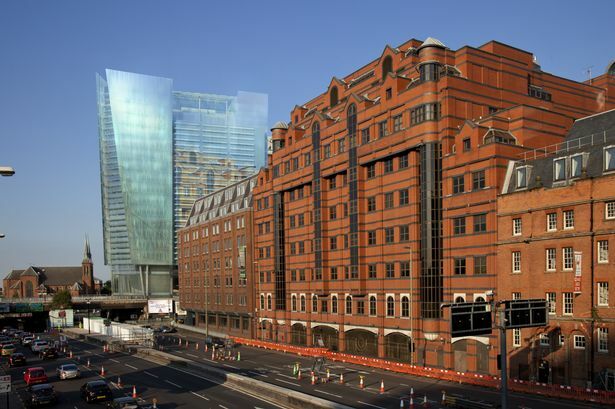 Three Snowhill will front St Chad’s Queensway, one of the key gateways to the city centre. Work had started on an earlier residential tower block on the site in 2008 but this stalled as a result of the economic downtown . Birmingham’s business leaders have also welcomed the deal. While council leader John Clancy added: “This is great news for Birmingham and builds on the city’s now established reputation as a leading centre for the business, professional and financial services sector.